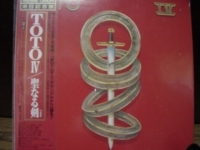 Japanese Mini Sleeve CD - items 400 to 425 Shop MyMusicFix!! 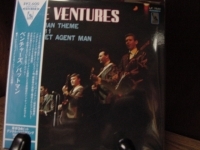 "The Ventures, Play The Theme From Batman - Mini LP Replica In A CD"
"The Who, My Generation - OBI Min - CURRENTLY OUT OF STOCKi"
"The Yardbirds - Having A Rave Up - OBI Mini"
"The Yardbirds, Roger The Engineer - Mini LP Replica In A CD - Japanese"
"The Yardbirds, w/ Sonny Boy Williamson"
"Toto IV - OBI Mini"
"Toto, Fahrenheit - Mini LP Replica in a CD"
"Toto, Isolation - OBI Mini"
"Toto, The Seventh One - Mini Replica LP In A Cd"
"Traffic, John Barleycorn Must Die OBI Box Set - 10 CDs"
TRAFFIC - JOHN BARLEYCORN MUST DIE - Japanese OBI MINI REPLICA LP TITLES making a 10 CD Box Set- Japanese OBI MINI REPLICA BOX SET Japanese re-mastered Mini LP replica Limited Edition Collection Recorded from the finest Original Masters available. Each title Comes with anti-static sleeves similar to Vinyl LPs, Cardboard packaging exact to the original LP, Re-sealable plastic wrap cases for protection of each collectible and include extensive Liner Notes Booklet. 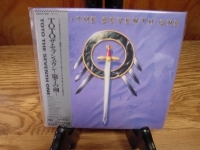 Actual miniaturized version of the 12" LP in 4" CD version Special VERY RARE LIMITED EDITION BOX SET ONLY PRODUCED ON FUTURES FOR THIS ONE TIME PRESSING -- were only available in Japan. 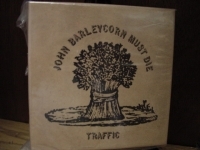 TRAFFIC BOX SET - JOHN BARLEYCORN MUST DIE INCLUDES: MR. FANTASY HEAVEN IS IN YOUR MIND TRAFFIC - SELF TITLED LAST EXIT JIHN BARLEYCORN MUST DIE WELCOME TO THE CANTEEN THE LOW SPARK OF HIGH HELLED BOYS SHOOT OUT AT THE FANTASY FACTORY ON THE ROAD WHEN THE EAGLES FLY These are Japanese digitally re-mastered Mini LP replica CDs (the OBI Edition). "Traffic, Welcome To The Canteen- OBI Mini"
"Vam der Graaf Generator, Still Life - OBI 3 CD Box Set"
VAN DER GRAAF GENERATOR - STILL LIFE BOX - Japanese OBI MINI REPLICA LP TITLES making a 3 CD Box Set- Japanese OBI MINI REPLICA BOX SET Japanese re-mastered Mini LP replica Limited Edition Collection Recorded from the finest Original Masters available. Each title Comes with anti-static sleeves similar to Vinyl LPs, Cardboard packaging exact to the original LP, Re-sealable plastic wrap cases for protection of each collectible and includes extensive Liner Notes Booklet. 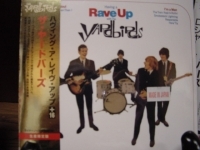 Actual miniaturized version of the 12" LP in 4" CD version Special VERY RARE LIMITED EDITION BOX SET ONLY PRODUCED ON FUTURES FOR THIS ONE TIME PRESSING -- were only available in Japan. 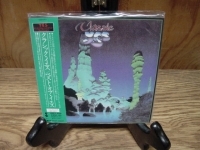 TITLES INCLUDED IN THIS BOX SET ARE: STILL LIFE - Japanese pressing of the 1976 album features the 5 original tracks plus the exclusive live bonus track 'Gog', packaged in a paper sleeve Track Listings 1. Pilgrims 2. Still Life 3. Rossa 4. My Room (Waiting for Wonderland) 5. Childlike Faith in Childhood's End 6. 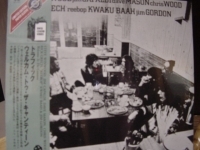 Gog [Live] GOD BLUFF - Japanese pressing of the 1975 album features the 4 original tracks plus 2 exclusive live bonus tracks 'Forsaken Gardens' & 'Louse Is Not A Home', packaged in a paper sleeve Track Listings 1. Undercover Man 2. Scorched Earth 3. Arrow 4. Sleepwalkers 5. Forsaken Gardens [Live][#][*] 6. 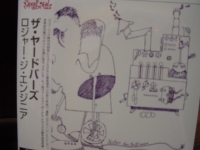 Louse Is Not a Home [Live][#][*] FOOLS PRIDE - Japanese pressing of the 1971 album features the 12 original tracks plus 5 exclusive Early Demo Version bonus tracks 'Reawakening', 'Summer Song In The Autumn', 'Birds', 'Sunshine' & 'Happy', packaged in a paper sleeve Track Listings 1. Imperial Zeppelin 2. Candle 3. Happy 4. Solitude 5. Vision 6. Re-Awakening 7. Sunshine 8. Child 9. Summer Song (In the Autumn) 10. Viking 11. Birds 12. I Once Wrote Some Poems These are Japanese digitally re-mastered Mini LP replica CDs (the OBI Edition). This Limited Edition Collection has only VERY FEW made world-wide and are immediately Out of Print. Recorded from the finest Original Masters available. Comes with anti-static sleeves similar to Vinyl LPs, Cardboard packaging like an LP, includes extensive Liner Notes Booklet. Actual miniaturized version of the 12inch LP in 4inch CD version. 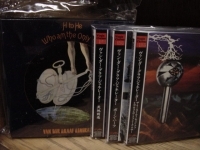 "Van Der Graaf Generator, The Least We Can Do Is Wave To Each Other - OBI 3 CD Box Set"
VAN DER GRAAF GENERATOR - THE LEAST WE CAN DO IS WAVE TO EACH OTHER - Japanese OBI MINI REPLICA LP TITLES making a 3 CD Box Set- Japanese OBI MINI REPLICA BOX SET Japanese re-mastered Mini LP replica Limited Edition Collection Recorded from the finest Original Masters available. Each title Comes with anti-static sleeves similar to Vinyl LPs, Cardboard packaging exact to the original LP, Re-sealable plastic wrap cases for protection of each collectible and include extensive Liner Notes Booklet. 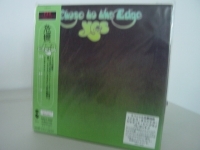 Actual miniaturized version of the 12" LP in 4" CD version Special VERY RARE LIMITED EDITION BOX SET ONLY PRODUCED ON FUTURES FOR THIS ONE TIME PRESSING -- were only available in Japan. 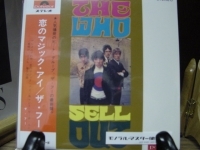 TITLES INCLUDED IN THIS BOX SET ARE: THE LEAST WE CAN DO IS WAVE TO EACH OTHER - Japanese pressing of the 1969 album has been remastered and features the 6 original tracks plus the 2 bonus tracks 'The Boat Of Millions Of Years' (B side of Refugees single) & 'Refugees' (single version) packaged in a paper sleeve Track Listings 1. Darkness 2. Refugees 3. White Hammer 4. Whatever Would Robert Have Said? 5. Out of My Book 6. 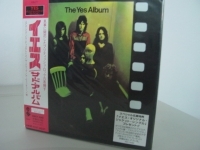 After the Flood PAWN HEARTS - Japanese pressing of the 1971 album has been remastered and features the 3 original tracks plus 5 bonus tracks 'Theme One' (original version previously unreleased), 'W' (alternate take), 'Angle of Incidents' (previously unreleased), 'Ponker's Theme' (previously unreleased) & 'Diminutions' (previously unreleased) packaged in a paper sleeve Track Listings 1. Lemmings (Including Cog) 2. Man-Erg 3. Plague of Lighthouse Keepers (Medley) 4. Theme One [Original Version] 5. W 6. Angle of Incidents 7. Ponker's Theme 8. 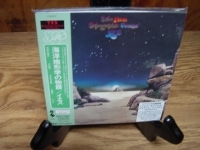 Diminutions H TO HE WE AM THE ONLY ONE - Japanese reissue of the 1970 album has been remastered and contains the original 5 tracks plus the 2 bonus tracks 'Squid/Octopus' (live in the studio Pawn Hearts sessions) & 'Emperor In His War-room:The Emperor/The Room' (early take). Track Listings 1. Killer 2. House with No Door 3. Emperor in His War-Room: The Emperor/The Room 4. 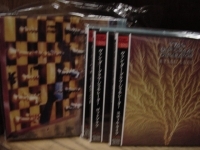 Lost: The Dance in Sand & Sea/The Dance in the Frost 5. Pioneers Over Csquid/Octopus [Live in the Studio, "Pawn Hearts" Session 6. Squid/Octopus [Live in Studio, Pawn Hearts Sessions] 7. Emperor in His War-Room [Early Take] These are Japanese digitally re-mastered Mini LP replica CDs (the OBI Edition). This Limited Edition Collection has only VERY FEW made world-wide and are immediately Out of Print. Recorded from the finest Original Masters available. Comes with anti-static sleeves similar to Vinyl LPs, Cardboard packaging like an LP, includes extensive Liner Notes Booklet. Actual miniaturized version of the 12inch LP in 4inch CD version. "Velvet Underground & Nico, 3 OBI Box Set"
VELVET UNDERGROUND & Nico - Japanese OBI MINI REPLICA LP TITLES making a 3 CD Box Set- Japanese OBI MINI REPLICA BOX SET Japanese re-mastered Mini LP replica Limited Edition Collection Recorded from the finest Original Masters available. Each title Comes with anti-static sleeves similar to Vinyl LPs, Cardboard packaging exact to the original LP, Re-sealable plastic wrap cases for protection of each collectible and includes extensive Liner Notes Booklet. Actual miniaturized version of the 12" LP in 4" CD version Special VERY RARE LIMITED EDITION BOX SET ONLY PRODUCED ON FUTURES FOR THIS ONE TIME PRESSING -- were only available in Japan. 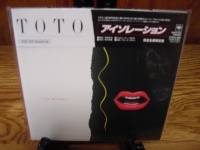 VELVET UNDERGROUND - Japanese OBI MINI REPLICA LP TITLES making a 3 CD Box Set- Japanese OBI MINI REPLICA BOX SET Japanese re-mastered Mini LP replica Limited Edition Collection Recorded from the finest Original Masters available. 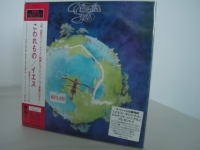 Each title Comes with anti-static sleeves similar to Vinyl LPs, Cardboard packaging exact to the original LP, Re-sealable plastic wrap cases for protection of each collectible and include extensive Liner Notes Booklet. 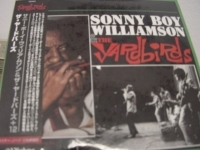 Actual miniaturized version of the 12" LP in 4" CD version Special VERY RARE LIMITED EDITION BOX SET ONLY PRODUCED ON FUTURES FOR THIS ONE TIME PRESSING -- were only available in Japan. 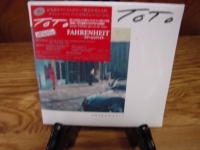 Check out Mymusicfix for additional Audiophile by hitting http://stores.ebay.com/Mymusicfix to view our current items up on E-Bay. 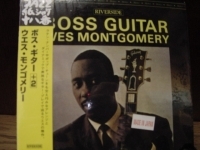 E-BAY STORE. FOR YOUR ADDITIONAL OBI RARE BOX SET SELECTIONS - INDIVIDUAL TITLE INFORMATION OR INDIVIDUAL PURCHASE JUST HIT THIS STORES TAB >. & TYPE IN OBIBOX INTO THE SEARCH FIELD WITHIN OUR STORES SECTION AS YOUR PERSONAL CODE AND ALL INDIVIDUAL TITLES + INFORMATION WILL APPEAR TITLES INCLUDED IN THIS BOX SET ARE: VELVET UNDERGROUND & NICO - BANANA LP PEEL OFF GATEFOLD COVER - Still impressive in its diversity, this influential album appeared like a supernova and endures as a classic because of the quality of the songs. With the exception of the discordant Black Angel's Death Song and to a lesser extent European Son, a lovely melody line underpins every song. This is especially evident on the melancholic Sunday Morning, the resigned Femme Fatale and the wistful All Tomorrow's Parties, but by no means lacking on more confrontational tracks like Venus In Furs or Heroin. I'll Be Your Mirror has the same folkie feel as Sunday Morning, while the roughness of Black Angel and European Son (the latter dedicated to poet Delmore Schwarts, one of Reed's heroes) has become more digestible as the mainstream has caught up with this pioneering work. The voice of Nico, the archetypical Teutonic Blonde, adds a strange and eerie dimension to the album as a whole. These songs have often been covered; to name just a few of my favorite interpretations: Sunday Morning by OMD, Waiting For The Man by John Cale and Nico on various of their solo albums, Femme Fatale by Propaganda, All Tomorrow's Parties by June Tabor, There She Goes Again by REM. The legacy of the VU, and of this album in particular, may be observed in the beautiful sonic sojourns of bands like inter alia Mercury Rev, My Bloody Valentine, Jesus and Mary Chain, Sonic Youth, Suicide and Swans. 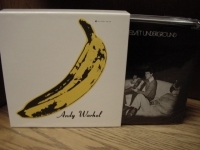 The Banana album remains a monument to the fierce spirit of rock 'n roll Track Listings 1. Sunday Morning 2. I'm Waiting for the Man 3. Femme Fatale 4. Venus in Furs 5. Run Run Run 6. All Tomorrow's Parties 7. Heroin 8. There She Goes Again 9. I'll Be Your Mirror 10. Black Angel's Death Song 11. 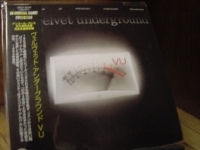 European Son VELVET UNDERGOUND - SELF TITLED - Track Listings 1. Candy Says 2. What Goes On 3. Some Kinda Love 4. Pale Blue Eyes 5. Jesus 6. Beginning To See The Light 7. Im Set Free 8. Thats The Story Of My Life 9. The Murder Mystery 10. Afterhours WHITE HEAT WHITE LIGHTIN - Track Listings 1. White Light/White Heat 2. Gift 3. Lady Godiva's Operation 4. Here She Comes Now 5. I Heard Her Call My Name 6. Sister Ray These are Japanese digitally re-mastered Mini LP replica CDs (the OBI Edition). This Limited Edition Collection has only VERY FEW made world-wide and are immediately Out of Print. Recorded from the finest Original Masters available. 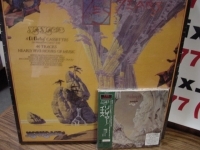 Comes with anti-static sleeves similar to Vinyl LPs, Cardboard packaging like an LP, includes extensive Liner Notes Booklet. Actual miniaturized version of the 12inch LP in 4inch CD version. 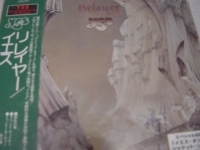 "Wes Montgomery, Boss Guitar - OBI Mini"
"Yes, Classic Yes - OBI Mini"
"Yes, Close To The Edge"
"Yes, Going For The One - OBI Mini"
"Yes, Relayer (Bonus 4 Cassette Box)"
"Yes, Relayer - Japanese Mini LP Replica in a CD"
"Yes, The Tales Topographics Oceans - OBI Two CD Set"
"Yes, The Yes Album - OBI Mini"